“This important and fascinating study of early modern England’s relationship to North Africa by the foremost expert on the topic is magisterial in its reach and groundbreaking in the implications it holds for seventeenth-century English culture and political history.”–Mihoko Suzuki, University of Miami “Following an incisive re-appraisal of “The Moor on the Elizabethan Stage”-vital reading for anyone interested in the plays of Shakespeare and his contemporaries – Professor Matar offers a groundbreaking study of Britain’s response to Barbary in matters of state and stage from 1589-1689. 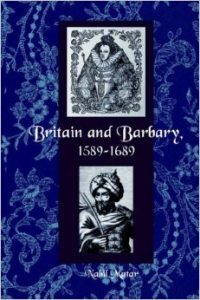 This is an exceptional final volume to an inestimable trilogy.”–Patrick Spottiswoode, Shakespeare’s Globe “Unique for its command of English and Islamic primary sources and for its grasp of literary, cultural, and political history, ‘Britain and Barbary, 1589 – 1689’ marks another indispensable contribution by Nabil Matar to our understanding of the relationship between Britain and Islam in the early modern period. Written with unusual clarity, Matar’s book organizes a wealth of fascinating detail within a narrative that informs our understanding and challenges preconceptions. While firmly grounded in the literature and history of the sixteenth and seventeenth centuries, the book has much to offer any reader who seeks to develop a better understanding of the multi-faceted history of Christian Europe and Islamic North Africa.”–Jack D’Amico, Canisius College Matar examines the influence of Mediterranean piracy and diplomacy on early modern British history and identity. Drawing on published and unpublished literary, commercial, and epistolary sources, he situates British maritime activity and national politics, especially in relation to the Civil War, within the international context of Anglo-Magharibi encounters. Before there was the British encounter with America, there was the much more complex and destabilizing encounter with Islam in North Africa. Focusing on specific case studies, Matar examines the impact of early visits of Moroccan officials on English playwrights such as Peele, Shakespeare, and Heywood; the captivity of thousands of British sailors in North Africa and its domestic consequences in the first women’s protest movement in English history; the captivity of British women in Barbary, especially the English sultana Balqees;the absorption of thousands of “moors” into the British slave trade; and the aftermath of the colonization and desertion of Tangier. Matar shows that when Barbary was militarily and diplomatically powerful, its relations with and impact on Britain were extensive. Nabil Matar is professor of English and chair of the Department of Humanities and Communication at the Florida Institute of Technology. This book is the third and final installment in his trilogy that includes Islam in Britain, 1558-1685 and Turks, Moors, and Englishmen in the Age of Discovery. While European and American literature are full of stories of captives held in the Barbary states, there are no first-person accounts of Moors held as captives in Europe. And yet there were thousands of Moors taken captive by the European powers. According to Matar, their stories do not survive because very few of them returned to their native lands. In his fourth chapter, “Moors in British Captivity,” Matar recovers what he can of the stories of Moorish captives. He also notes the different kinds of captivity in Barbary. A slave (‘abd) was purchased, while a captive (aseer) was held for ransom. Slavery (‘ubadiyya) and captivity (asr) were different institutions. All of the North African states were engaged in the trans-Saharan slave trade, as well as trade in gold and other goods. The capture of European sailors was a different facet of the economy (pp. 114-115). For Matar, though, the real focus of this chapter is on the European enslavement of Moors. Europeans did not differentiate between the status of their captives; raids by European powers in retaliation for the piracy of Morocco or Algiers and the bombardment of the North African cities were among the factors, he argues, in the economic and political decline of these polities in the eighteenth century (pp. 131-132). Nabil Matar is professor of English and chair of the Department of Humanities and Communication at the Florida Institute of Technology. This book is the third and final installment in his trilogy that includes Islam in Britain, 1558-1685 and Turks, Moors, and Englishmen in the Age of Discovery.